Happy Valentines Day to all my female friends. Denise got her present the other day. For some time now my next day specific plans change when I wake up. This is not bad as I am still working to the overall conceptual plan. Today was no different. I decided this am not to book the overflow site for 2 weeks in a couple of weeks. I was up at 5am and at the showers at 6am and went right in with no wait. Just before I left I decided to hit the bathroom and there were none open. The problem is that there are two showers and two toilets for the campground and the bathroom and the shower are in the same room. It's a small campground and I am sure that most residents that are motor homes and 5th wheelers have their sewer & shower in their units and not use the campground ones. The concept of an all-in-one shower/bathroom can be good for families. And they were maintained spoymtless. They even leave you cloth towels to whipe the sink and floor for the next person. My problem is that I have not used the toilet at the camper but do use the gray water. I also don't have an inside shower. So I kind of rely on the campground's if I am paying. When I am not paying and have no services I work out alternate plans. I just didn't feel that it was adequate and who knows with the way I have been I m am libel to change my plans after I made my decision. I can always check back later and spend a few days there if there is an opening. This campground was super convienient being on the light rail to get close to 3 ball parks and the new Mesa field is for the Cubs was only a 10 minute bike ride there. 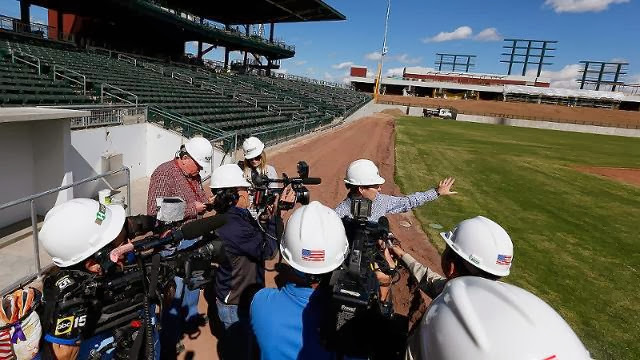 After leaving the campground I drove by the new Cubs field in Mesa about 1 mile north and one mile east. It is new and never been used until Shia spring season starts. There appears to be plenty of free parking. 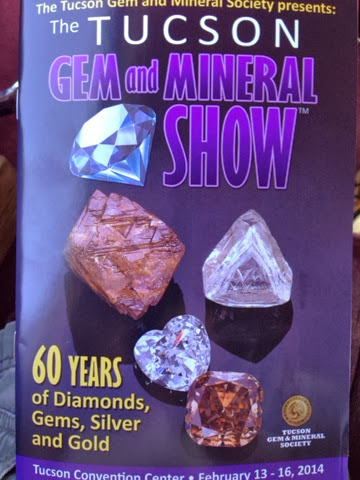 My change of plans today moved me to go back to Tucson to the Gem Show that is this weekend. This is not a small ride but works out ok as when I am down that way I will take I8 to CA later today. The Gem Show was down town Tucson and the minimal parking lot for the convention center was full at $8 per car. There were 15 min meters but that would not work, so I drove around the block and found 1 hr parking at no cost. It was Senior Day at the show (62 and older) so I got $2 off the $10 entrance fee. I was glad I had not invested more money than I had to see the show. It was large but they were mostly dealers and very few artists. It's a great place to go for raw gems, low-end and high-end Jewelery. I like the artists at the fairs we go to in VT better as their items are more individualized and these seemed more mass produced unless you were looking at high-end. 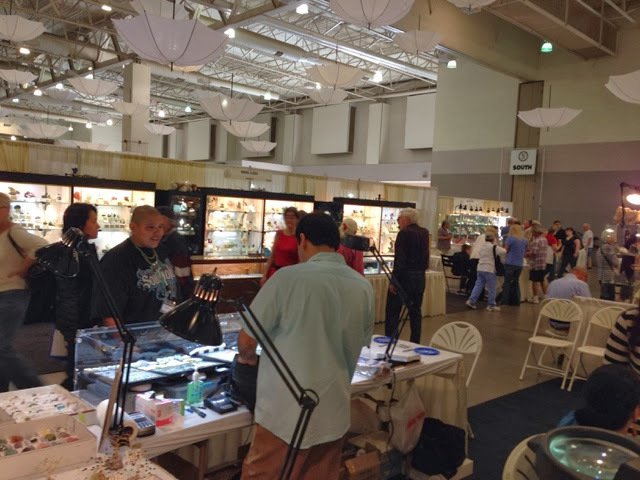 I do have to say that there is more than one gem/Jewelery show going on in Tucson and others may be more what I would be interested in but I wanted to move on. The other annoying thing was there were do many school groups there it made it difficult at times to get around on my one hour curbside parking time. After leaving I did speak to Denise about my feelings and she and I agreed that the Quartzite,AZ show we went to many years ago was more artists and reasonable pricing. 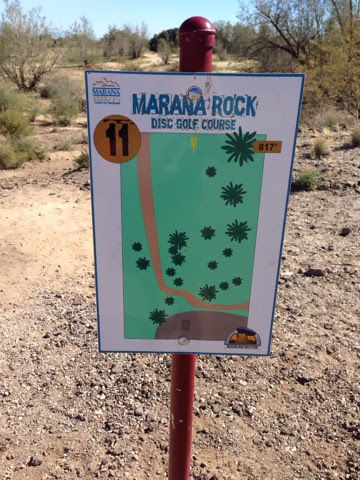 My first stop after leaving downtown Tucson was another disc golf course. I had expected a bit of mundane course based on the other Tucson and Chandler courses, but how wrong I was. This course kicked my but after the fourth hole. The first basket was on a high spot with drop off on all sides, but the drive was reasonable at 300+ ft. Challenging but not a but kicker. 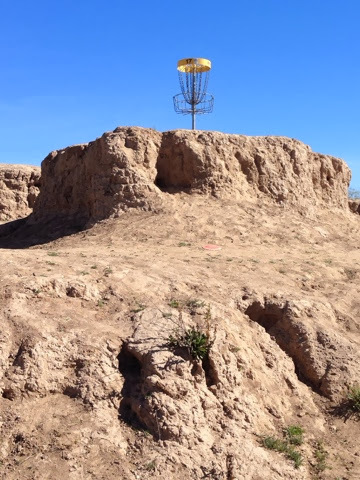 Here is another basket on a bluff. Well 300+ foot drives went to 400+ drives to 500+ foot drives and by the 7th hole my arm was showing some strain trying to get the distance as far as I could on each throw. Well my heart sunk when I saw this hole. I am not a powerful driver with smaller arm muscles than many but this was the hole that broke my spirit. I trudged through the rest of the 18 holes at the Maana Rock Course with a respect for the players of this course. The air temp in the shade was about 88 deg and I started to wilt under the sun. No complaints in comparison to what weather we are having back home. 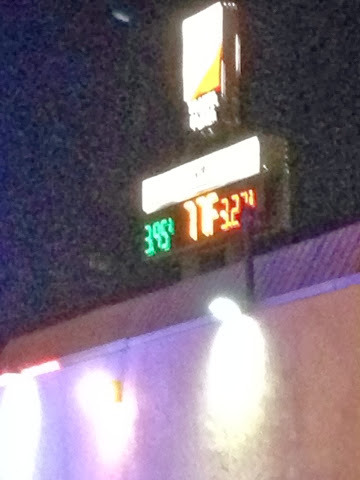 After leaving Marana I headed west on I10 and got gas just before the I8 split at a Pilot truck stop. When I got my Good Sam's card the other day I was told that I would get gas discounts off each gallon by buying at Flying J or Pilot, although their gas price is generally the lowest. I used Flying J but didn't see how to get the discount. I was told by Bob the family friend to go unside for the transaction. So I did and was told that you could not use my temporary card as it has to be swiped and there is no magnetic strip on the temporary card. 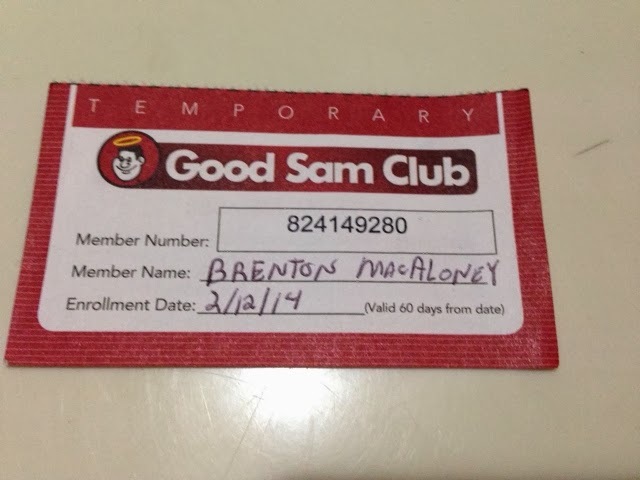 I called Good Sam Club and the man on the phone confirmed that I need the card with magnetic stripe they will mail to me. I explained that I was one month into a 3.5 month trip and I won't need the card when I find it at home when I get there. He says he can mail it to me if I have an address I will be at. I said I will be in CA for 2 weeks and he says that will not work as it takes 3 weeks to have the card mailed. I grumbled in a good jesture he added one more year to my club membership for the misunderstanding since a selling point at Camping World for joining is that you gat gas discounts. My day is not over for running into issues. On I8 70 miles from the CA boarder I drive over a 2 to 3 foot piece of trailer truck tread that had come off some rig. There was just a bump bump for both passenger tires hitting it. It didn't come up and hit anything. Well the next thing I know I am decelerating and my first thought was the cruise control had disengaged, but a check showed the gas peddle to the floor trying to accelerate. I took off the cruise and noticed now I notice the engine was not running. I put the transmission into nuteral and coasted to a stop. I tried to start the engine and it would turnover but would not start. I tried a couple of times with no avail. I went into my engineer mode and knew the engine was good and said to myself it has to be either no spark or no fuel. Then I remember yesterday when I started it and was driving away from Bob's that the camper had stalled. I didn't think much about it at the time. If there is no fuel it could be an electrical problem. With bad contacts to the fuel pump. A 20 year old vehicle could have some minor corrosion on a connector that the bump of the tire teed could have loosened the connection enough to cause such an issue. I could have removed the engine cowling in the cab and taken the air cleaner off and looked for fuel but I opted to start moving all the connections and after fussing with it for about a half hour it started. It ran ok to the town just before Yuma, AZ and I stopped at a Flying J for gas and since it was getting dark I decided to park for the night not knowing if I will be asked to leave at dome point. I want to look at the connections in the morning light and wanted to stop not wanting to break down in the dark on the highway. If I am asked to leave there are two casinos about 20 miles away that accept overnight. One you have to patronize the other is a small fee. I was thinking about these as my overnight stop before this happened. I will leave you with my parting shot of the time temp here. It's 8:54 and 77 deg. Ohh ya!